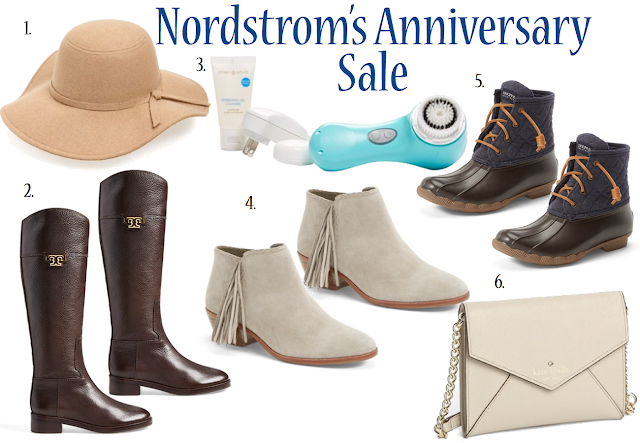 The Nordstrom’s Anniversary sale is finally here! It’s seriously one of my favorite sales of the year. It’s always packed with amazing deals, free shipping and returns (heck yes! ), and new products that will become my go-to favorites for Fall. For me, I’m always buying for Fall during the sale, prepping for those cold months when I need warm boots and cute accessories. It’s really great because you’re getting these deals BEFORE the season has even started so it’s not something you have to hold onto for an entire year or something that might go out of style by next season. This is the time to splurge on those more expensive items, like the Tory Burch ‘Joanna’ riding boots, which will last years and years and years and never go out of style or even the Sperry take on the duck boot with the ‘Saltwater’ rain boots. Seriously, so cute! Don’t wait too long because these items are going SUPER fast so get in there now and thank me later. I may or may not have bought a few things from your list. You can never have too many hats! Right? I need those boots! Those are on my #NSale list as well. I snagged the mini pink & black Pashli bag, but need to go back for those fringe booties! I love the anniversary sale too! I picked up some cute Ugg sneakers and a bunch of other things. Those fringe booties look adorable!